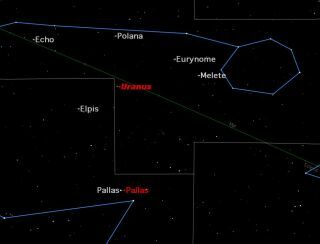 : The bright asteroid Pallas is well placed for observation this week as it reaches opposition in Cetus on Monday September 24. Although we read a lot about asteroids, most amateur astronomers have never seen one. This week, weather permitting, is a great opportunity to view one of the largest and best known space rocks: asteroid Pallas. Now that Ceres, the largest space rock in the asteroid belt, has been reclassified as a dwarf planet, Pallas is tied with Vesta as the largest asteroid. All three were discovered in the early years of the 19th century. William Herschel suggested they be given the name "asteroid," meaning "star-like," because, in the telescopes back then, they were so small that they looked like stars. The name is unfortunate because asteroids are nothing like stars: just small lumps of rock in orbit around the sun. Pallas was discovered in 1802 by German astronomer Heinrich Wilhelm Olbers, best known for stating Olbers' paradox: the darkness of the night sky conflicts with the assumption of an infinite and eternal static universe. This was the very first piece of evidence for the Big Bang theory. Although a giant among asteroids, Pallas is a very small object compared to the planets. Its rather lumpy shape measures 362 by 345 by 311 miles (582 by 556 by 500 kilometers), about the size of New Mexico, the fifth largest of the United States. On Monday, Sept. 24 — the night of opposition — it will be close to the 4th magnitude star Iota Ceti, just north of the 2nd magnitude star Deneb Kaitos, Arabic for "the whale's tail," the brightest star in this part of the sky. You will be able to see Pallas move relative to Iota from one night to the next. The chart included with this Pallas observing guide shows the planet Uranus and a number of other asteroids (in white). This will give you an idea exactly how dense the asteroid belt really is: not very. Unlike the impression given by "Star Trek" and computer games like "Asteroids," the real asteroids are very few and far between. In fact, if you were standing on any one asteroid, you would need binoculars to see the nearest asteroid. One of the most remarkable features of Pallas is the extreme tilt of its orbit. At 35 degrees to the ecliptic, this is one of the most extreme tilts of any solar system object. Rather than moving left-right like most solar system objects, it actually moves almost north-south. Also, like Uranus, its pole points almost parallel to the plane of its orbit. All in all, Pallas is one of the strangest objects in the solar system, well worth a look.